For the region, see Tibet (region). 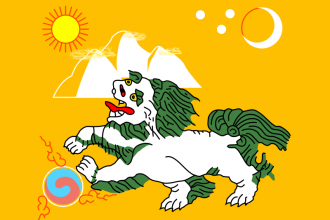 Tibet is a formable nation in Asia, and can be created by countries with both Tibetan as their primary national culture and the Vajrayana religion. Once formed, it is bordering Ming to its east, Chagatai to its north, and the numerous Indian states to its south and west. The Tibetan Plateau was once united under an empire sprawling beyond it. By bringing together the Tibetan people once again, we can revive this legacy. has not enacted this decision before. must have at least 5 cities. Lhasa (677), Garze (2135) and Tachienlu (678). the province is removed from the HRE. gets the opinion modifier “Removed provinces from the Empire” towards the country, worth −50 opinion with a yearly decay of 1.
will no longer be under the control of an estate. becomes the capital of the country. gets a permanent claim on every provinces of Tibet (region) (except Central Altishahr area) and Ladakh (2074) that it does not own. then it gets the event ‘New Traditions & Ambitions’. Provinces in orange must be owned and cored to form Tibet. Forming Tibet grants permanent claims on the shaded area. After years of misrule by weak kings who were puppets of foreign powers, the Dalai Lama, long the spiritual leader of the Tibetan people, has taken full control of the government. His Holiness, the Dalai Lama, seeks your advice. What kind of foreign policy should we pursue? This event happens only once during a campaign. has a ruler with one of its skills less than 3.
is not a theocracy or the Celestial Empire. The year is before 1642.
else it gains 50 administrative power. The Dalai Lama regards the assembled throng of petty Khans as though they were his trained mastiffs. Through them he knows his dominion over Tibet will be secured; he must only choose how. The safest plan would be to secure a treaty with the Khans, seeking their assurance that they will do their utmost to defend Buddhism in Tibet, in particular the body of the reborn bodhisattva himself. A more radical approach has also occurred to the enlightened monk; if the Dalai Lama were to invite one of the Khans to rule as his puppet, he would never need fear resistance from Tibet’s contentious noble families. Ruling from the shadows holds a certain appeal. He turns to the Khans to announce his will, a placid smile hiding his veiled ambition. Establish a rapport with the nomands. Invite the Khalka Mongols to rule. Invite the Khoshuud Oirats to rule. Invite the Dzungar Oirats to rule. This page was last edited on 18 March 2019, at 11:21.